A business providing services to a local market should not underestimate the importance of local SEO services. Local SEO efforts often produce more website traffic and more leads. Higher conversions result when your local listings are optimized to accurately reflect your business information, products and services. Our Omaha SEO team can tell you over and over about why local search engine optimization is important, but how about I just SHOW you. But before I do… let me tell you one more time. An optimized Google My Business (GMB) listing will help you pull up in Google for relevant searches – as this information pulls into the local map-pack, which has high visibility. Get a Step-By-Step Guide for setting up your GMB page, if you don’t already have one. Your Apple Maps listing helps your business rank well for Siri voice command searches. And with over 700 million iPhones current being used worldwide, many users are using Siri search on their iPhones. And, Yelp provides Apple with access to some of its business page information, including reviews. So, optimizing your information and managing reviews for Yelp could not only assist you in organic rankings, but can also help with visibility in Apple Maps. Here’s an example Google search for Dentist Omaha. You will see the paid ads appear at the top of the page, then the map pack, then organic results. Then at the bottom of the page are more paid ads. This image shows us two things. First, it shows us the importance of having a local SEO strategy. The map pack pulls in GMB pages organically based on the search query, matching the GMB listing with the keyword(s) being searched. And, the first organic result is from Yelp. While that isn’t the case for every search result for every product of service Yelp still ranks well for local product and service queries. Second, this image shows the need for a holistic approach to your web marketing strategy. A Google Ads strategy partnered with local search optimization AND website search engine optimization efforts will help your business appear in all three sections. Local Search pulls results into the Search Engine Results Pages (SERPS) based on businesses and places near a user’s location. These local search results appear in the map, commonly referred to as the map pack or three pack, and results. Being present in local search for relevant searches can dramatically affect your impact, pushing quality traffic and increasing conversions. 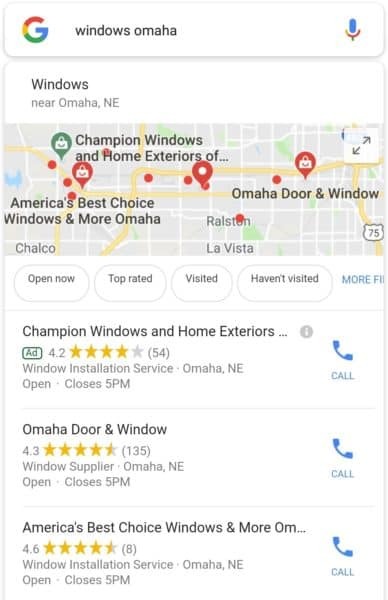 Three critical places our Omaha SEO team pushes for local search impact is Google My Business (GMB), Apple Maps and Yelp. In fact, we’re offer a FREE optimization of all three of these platforms during December 2018. Why is local search so important? If you’ve done a Google search for a product or service, you’ve noticed that Google is putting more and more emphasis on serving results from its server instead of pages from individual websites. This is by design and is only the beginning of how Google plans to morph in a source of knowledge, instead of serving a knowledge buffet. Considering these ongoing changes, local search is more important than ever. With its prominent placement on SERPS, the map pack can provide big results for your local business in the search engines. This information is pulled in through Google My Business account information. Google serves its local results based on three main factors: relevance, distance and prominence. Of course, you should care about Google My Business. An optimized GMB page is necessary for success in local results on Google. Not only does it appear in relevant searches on the map pack, but it also provides quick, easy to access business information for customers and prospects. Knowing that Google serves its results by relevance, distance and prominence, and that the most visible results are being served by Google’s servers, its easy to see why GMB is an important factor for local SEO success. All three of these factors play upon your accuracy and investment into the page. There is no way to pay for better local ranking on Google, but by filling your GMB page with accurate information and actively managing the listing your going to make progress toward being found on local search results. Why care about Apple Maps & Yelp? If you’re not an Apple user, you probably don’t use Apple Maps. But you’ve likely heard of it, having marred with bugs and broken data partnerships. Nevertheless, Apple has put big money into fixing its Apple Maps App and its reputation over the last couple of years. Apple Maps is relevant because over 700 million iPhones are currently being used worldwide, and many of these users use the default Siri search on their phone. Siri returns Apple Maps results and, in fact, to use Google Maps on an iOS requires an additional step to query a local business, product or service. With the popular rise of voice command search it’s clearly important to have an optimized listing on Apple Maps. As for Yelp, it provides Apple with access to some of its business page information. And instead of building its own database for reviews, they utilize Yelp reviews. So, by optimizing and managing your Yelp listing to include accurate information and responses to reviews, you are syncing with Apple Maps to provide it better data. Do not wait to use these free tools for local SEO. Not only will these tools help you be found in local results, but when optimized and managed well, will help you to complete on Google amid its changing algorithms. Want to make sure you get this local optimization in the bag? During December 2018 we are offering a FREE local search optimization, so don’t miss out.